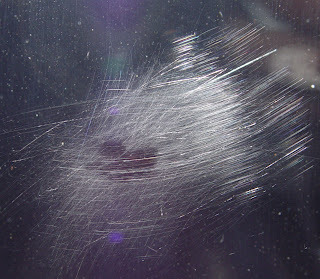 Our glass scratch repair service experience make us the number one glass scratch removal company nationwide. We only use the most effective, cutting edge glass scratch removal techniques and glass restoration techniques to keep our glass scratch removal prices low. architectural window glass scratch damage. a product called Glass-Crete that is a proprietary formulation containing phosphoric acid and acid compatible polymers. The phosphoric acid will break down calcium in the concrete without affecting the glass surface in any way. These specialized polymers help lubricate the surface, help prevent scratching when removing concrete. 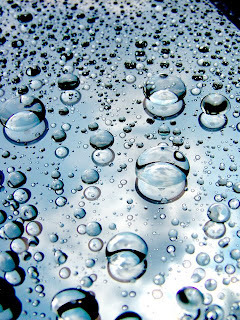 These polymers remain on the glass surface and help prevent adhesion of concrete that makes contact with glass in the future. 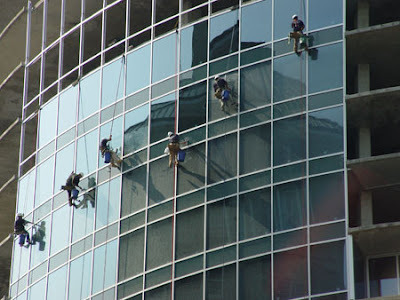 Scrapers should never be used to remove concrete from glass, as they will certainly scratch the surface by trapping abrasive concrete particles under its metal blade and dragging them along the surface. Once concrete or its slurry coat is removed from glass surfaces, most times there will be mineral stains present. These mineral stains will need to be removed by method of wet sanding the glass surface to remove the top layer. This is due to the minerals found in concrete, mainly silica, fusing to minerals in the glass and creates a tenacious bond. This can easily be performed using the Glass ReSurfacer System. This system will remove light scratches that may have been caused by concrete removal. Once glass is completely restored, we apply a protective treatment that will help prevent the adhesion of mineral-based stains such as concrete. As well, protect against other types of stains and scratches due to the high performance polymeric barrier in-between the glass surface itself and damaging elements. Once a virgin glass surface has been applied to glass, it is important to seal it with a high performance protective treatment that will fill in the minuscule cracks and valleys of glass and create a polymeric barrier to protect it. One such product is The Glass Defender Series consisting of an MD, HD and a Primer depending on the level of protection desired. In most cases, Glass Defender MD is used standalone by simply applying it to glass, and polishing with a micro fiber towel. Presto’s protective treatments utilize high performance silicone materials that cure to a strong polymeric film invisible to the naked eye. As well, these materials are partially inorganic similar to glass itself and will be as permanent as the glass surface.To remove a few top layers of glass and apply a new glass surface free from defects that produces its original appearance. Other glass restoration or renewal products utilize acids or harsh abrasives and when used incorrectly, which is extremely easy to do, will damage glass by either acid burning the surface or installing hairline scratches that are most visible in direct sunlight. Presto Restoration Products also has a product that can be easily applied on exterior glass that will prevent adhesion from abrasive materials such as concrete and will lubricate glass surfaces to help prevent scratching during the construction clean up process. This product is invisible and does not need to be removed like other glass protection products.